Because a pretty big portion of my sewing gets done in the dark (aka before sunrise) I figured what better way to photograph this baby clothes blanket than with the morning sun coming up. I made a promise to myself that I wanted better blog pictures, so I braved the cold this morning and went out on the back porch to find some natural light. 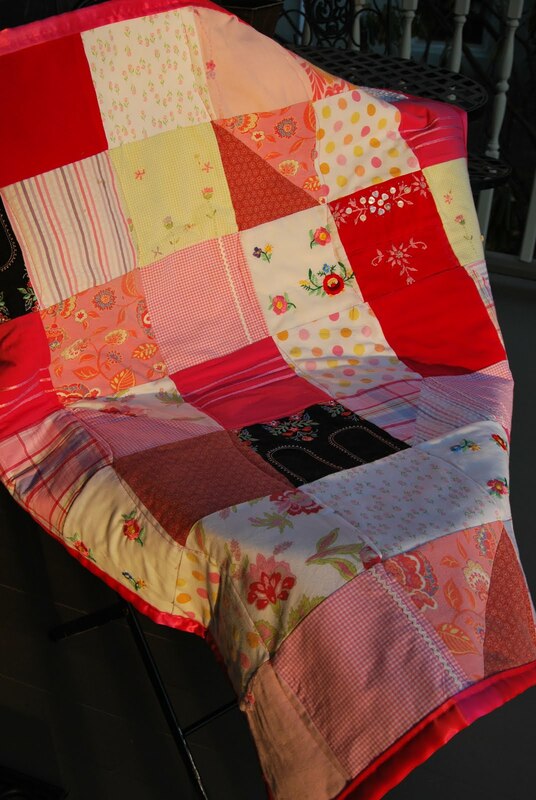 This is a small lap quilt I made out of baby clothes sent to me by my sweetie's cousin. They are from her youngest daughter (she has three, which means there are two more projects quickly to follow behind!). The back is a crib sheet. The bag of sweet baby things has been in my sewing room since JULY! Now, in the land of my sewing room, that might not even qualify for a UFO, just something that I've put down for a few days. Jessica asked me to make something simple (thank GOD) with squares and triangles. So every time the mood struck me, I'd carefully go through the pile and cut a few more squares. When the pile looked pretty big...I started sewing. Not very scientific, or very organized, but I have to tell you, I love the way this came out. Of course you can see that my quilting leaves SO much to be desired still...but I did learn a whole bunch of things while I was working on this project. 1. Different fabrics, even when cut into relatively small pieces, can still give you loads of trouble trying to sew straight, with even stitches. 3. Cats love baby clothes to lay on even more than freshly laundered fabric. 4. For some reason, the sweetness of upcycling a baby's things, even when it's not your own baby, makes the project really enjoyable. I can just imagine the adorable skirts and dresses on my cousin-in-law's daughter, and I hope she loves seeing her things made into a blanket she can keep forever. 5. I have given myself permission to love satin blanket binding. It reminds me of being little myself. I always had blankets with that kind of binding on my bed, and they seemed so glamorous to me then! I had to press into half size, or it would have taken up too much of the outer squares, but it really looks cute with the clothes. It would have taken me 10 years to make a binding out of the tiny clothes I had left. Of course, I did all of this cutting before I bought my AccuQuilt Go! cutter the other day. I got it at Joann for $199. I've been searching and hunting for it, to find the lowest price possible, and I snagged it as soon as I saw the flyer come out. I'll be cutting my next quilt with it, so I'll tell you all about how much I love it.